The Blanket Lady 1st Annual Photo Contest! What does a winning photograph look like? It can range from a newborn baby wrapped in a blanket…or a beach scene with a blanket spread across the sandy shoreline – to a snapshot capturing your pet napping on a blanket...or a child enjoying her picnic blanket with her doll. 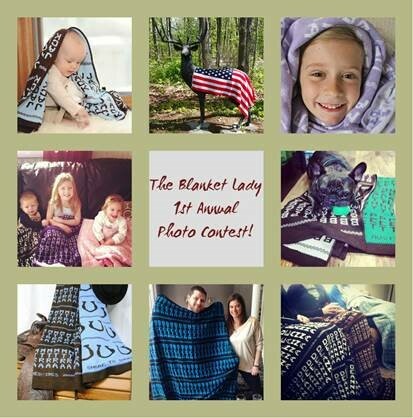 The key word is “blanket” and we are looking for your best photographs with “The Blanket Lady” blankets included. Be creative! Submit your high resolution, large-sized photo by June 10th to blanketlady@mackellar.com (include the category as well as your place of origin). We will also need you to submit the form below, which grants us permission to use your photo on our website and social media accounts. Baby ~ Child ~ Adult ~ Pets ~ Scenery / Misc. Our panel of judges are ready and waiting for your blanket photos! Good Luck! Winners will be announced on June 15th. Stay tuned for our upcoming photo contests in August, October & December!